This popular atlas of the Columbia, Snake and Willamette rivers contains large-scale reproductions of NOAA charts for the Columbia River from its mouth to the Tri-Cities, the Snake River from the Tri-Cities to Lewiston, Idaho, and the Willamette River from Portland to Newberg. Major facilities (& their services) along these rivers are indicated on the charts. A special chart of dangerous bar areas for the mouth of the Columbia River is included, along with charts of Ilwaco Harbor, Bonneville Dam, Hood River, The Dalles, and John Day River. Also included are coastal charts extending north to Destruction Island, WA, & south to Yaquina Head, OR, charts of the Upper Snake River (to Hells Canyon Dam), a guide to the Hanford Reach, a Lower Snake Recreational guide, and the United States Coast Pilot for the Columbia, Willamette, & Snake Rivers. 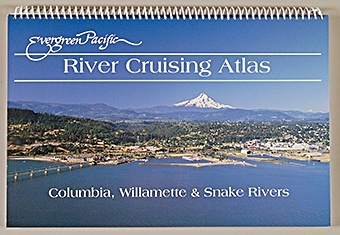 This nautical atlas is an absolute essential for boaters navigating these major rivers of the Pacific Northwest.